After going 20th overall in the first round of the 2015 NFL Draft, Nelson Agholor did not exactly get off to a hot start with the Eagles. Agholor played the third most snaps of any rookie receiver last year but produced just 23 receptions and 283 yards while scoring only once. The Eagles offense finally fell apart in Chip Kelly’s final year as the head coach, careening to a 25th ranking in Football Outsiders DVOA, and Agholor didn’t do much to alleviate the issues. It was a disappointing start for a draft prospect who was truly dynamic in his final year at USC and had many fans in the draft community. One of those believers was yours truly. I had Agholor as my fourth ranked receiver coming into the 2015 NFL Draft and believed he was a Golden Tate-type of asset. He looked like a player that could grow into the role Jeremy Maclin vacated when he bolted for Kansas City in free agency. The raw numbers show he wasn't ready to assume that position as a rookie. One of Kelly’s biggest downfalls as a team-builder was the belief he seemingly held that he could just cycle X-receivers in and out and get identical production out of them. After DeSean Jackson and Maclin had career years in that role, Agholor put an end to that theory. With just a casual glance at some of Reception Perception’s main metrics, it would seem the series also backs-up the assertion that Agholor’s rookie year showed no promise whatsoever. The rookie checked in with a 61.4 percent success rate vs. man coverage and a 62.2 percent rate when facing press. Both scores are below the league average and speak to the trouble he had executing as the team’s primary X-receiver. ​It was clear Agholor just wasn’t ready to handle the burden of going against these difficult matches week-in-and-week-out. He recorded a reception on a mere 5.5 percent of the 256 routes he ran in his Reception Perception sample. While those metrics don’t help alleviate any concerns brought on by Nelson Agholor’s poor statics as a rookie, a deeper dive into his route-by-route data does lead us to potential optimism. A whopping 65.6 percent of the 256 routes Nelson Agholor ran in his Reception Perception sample were either a slant, post, curl or dig. These sharp cut and in-breaking patterns were some of the routes that fit the skill set many found appealing with him as a draft prospect. Agholor is a quick-twitch player who uses disciplined technique integrated with agility at the stem of routes to flash open. Those skills did not evaporate when he got to NFL level. Nelson Agholor’s best success rate vs. coverage scores came on those routes he was assigned most often, outside of the nine-route. Agholor posted an abysmal 39.6 percent success rate vs. coverage score on this pattern, proving incapable as a first-year player of being the deep threat that Maclin and Jackson were for Chip Kelly in previous seasons. However, this is an important juncture where we must note that Agholor reportedly suffered a high-ankle sprain at midseason and then played on it the rest of the year. This matches up with what he put on game film. Agholor still showed the same technical detail in his routes but looked noticeably less explosive as a rookie. Outside of that one pattern, Agholor scored quite well on the routes he ran most often. His success rate vs. coverage scores on slants, curls, digs and posts were all well above the league average for each pattern. Agholor’s success rate on slants (82.8) and posts (80) are particularly encouraging. Even while operating at less than 100 percent health, Agholor still showed that ability to set defenders up with craft and shake loose at the stem of routes. If he’s in better condition without a damaged ankle this coming season, he could make more big plays on those routes. His success rate on curls (80) and digs (76.2) in addition to slants are also nice to see considering the change in Philadelphia’s coaching staff. While playing for Andy Reid and new Eagles’ head coach Doug Pederson in Kansas City the last three seasons, Alex Smith posted average depth of aim throw (via Pro Football Focus) figures of 6.8, 6.0 and 6.9, the lowest among starting quarterbacks each year. The short passing game will be at a premium in the Eagles offense this season more so than in Chip Kelly’s scheme. The West Coast offense that Pederson and his mentor Reid employee is predicted on emphasizing timing-based, quick strike in-breaking routes from the wide receivers. Looking at Reception Perception favorite and current Chiefs receiver Albert Wilson’s route percentage chart we seen more optimism for Agholor. 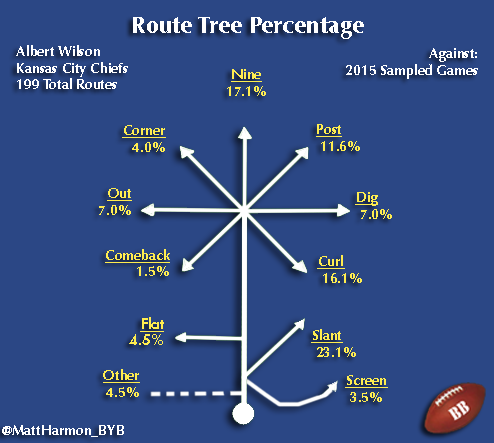 Of the 199 route Wilson ran in his 2015 Reception Perception sample 57.8 percent of them were slants, curls, digs and posts. 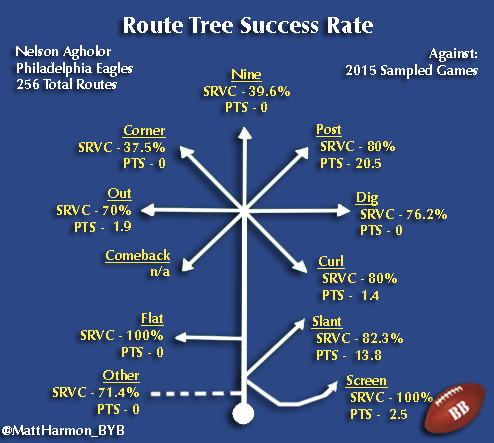 Again, those are the routes Nelson Agholor showed best at in his sample. The fact that Agholor will seemingly be in an offense that assigns its wideouts the routes he's best at is a good sign for his future projection. Especially if he’s more comfortable, healthier and faces something easier than the murder’s row of cornerback battles he faced last year, Agholor could enjoy a fine bounce back season as a second-year player. Given Pederson and Reid’s tendencies in Kansas City and some of the questions behind center, the new Eagles’ passing offense doesn't project to be particularly voluminous or robust, so perhaps Agholor won’t pump up the stat sheets. However, with Jordan Matthews pigeonholed as primarily a slot receiver there’s room for one of these outside wideouts to step up. Agholor has a chance to make a bigger impact than many assume after a slow start to his rookie career.